The growth of modern manufacturing techniques using sophisticated machinery, has today resulted in the demand for greater accuracy from the most widely used cutting tool - the twist drill. The many dimensions of twist drill geometry are extremely important, as the use of correct twist drill geometry can result in large savings in time, materials and money. 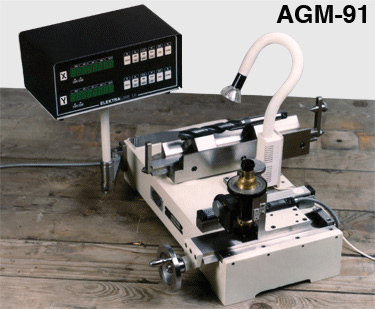 The AGM-91 was developed for the precise examination, measurement, and control of twist drill geometry. Note: The Triple Axis (X,Y,Z) DRO-ELEKTRALINE 3A (AGM-92) is also available. The Single Axis DRO -ELEKTRALINE 1A (AGM-90) is no longer available. Twist drills ranging from 3mm to 75mm diameter can be inspected and measured on the Goniometer. The Drill Analyzer can inspect and measure the following geometrical features of drills. Inspection and measurement of all aspects of drill geometry with remarkable speed is made possible by theDrill Analyzer's unique design. Exceptional accuracy is achieved through the combination of angular measurement by optical goniometer and linear measurement by micrometer or dial indicator. Difficulties and wasted time trying to measure drill geometry by rule of thumb methods are eliminated by the Drill Analyzer. With the design of the Drill Analyzer, only a minimum of bench space is required. For maximum clarity of readings, low volt lighting has been incorporated into the unit. Time, materials and cost can be saved at the production stage, as this equipment takes care of the drill geometry inspection and measurement, besides eliminating costly scrap due to faulty tooling. The Drill Analyzer is the finest unit obtainable for this purpose. Can be used as a preselectable counter and for dimensional measurement in both Metric and Imperial standard. Can be interfaced with any make of Linear Scale and Rotary Encoders which are TTL compatible. Micro-controller based design for digital readout. Memory back-up is provided under power-down conditions for all vital machine parameters. Backlash compensation with EMS rotary encoders. For Linear measurement, ELEKTRALINE DRO is versatile allowing various modes of operation. The linear scale unit is coupled to the moving member of the machine. When the slider moves, pulse are generated which are processed digitally and represented as displacement with respect to reference point. For more detailed information and operating instructions, see our PDF files. To download PDF, right click link and choose "Save Target As"